South Sudan is the world’s youngest country, being recognized in 2011 after many decades of war. The people in South Sudan are in a desperate state. There seems to be a real lack of hope, or ability to see what they have going for them, rather than just seeing what they do not have. Many people are just lying around, being idle with maybe one family member eeking out an existence for the extended family. Most people eat once per day. Thomas Lubari, a BHW partner in Uganda (UGA04), is a refugee from Sudan and in addition to leading a church in Jinja, Uganda, Thomas makes frequent visits to South Sudan where he is involved in church development, loan programmes and training leaders. 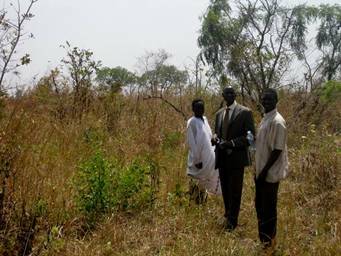 The community there has offered Thomas' church a block of land that is around 15km (10km on road and 5km thru bush) from the town of Yei. The land is about 10km by 10km. At one end of the land there is a river which never runs dry, and people used to grow coffee there. The owner of the land wants to see the land in the hands of the church to help develop the community. Initially the plan is to clear 8 acres and plant: 2 acres ground nuts, 2 acres onions, 1 acre sugarcane, 1 acre sweet cassava, ½ acre pineapples, ½ acre bananas, 1 acre of vegetables, cabbage and tomato. Thomas has big plans for the place but initially they will start small and then once it is proved that crops can make the money anticipated, other things may be slowly added. 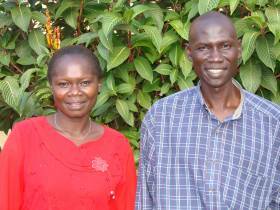 Bright Hope World has been partnering with Thomas and Joyce Lubari in their work in Jinja, Uganda since 2007. BHW's Field Director was with Thomas and Joyce in July 2011 on the day that South Sudan gained independence; it was time of great passion and rejoicing, reminiscing and planning for the future. Thomas has huge dreams for his land of birth that includes micro-loans, income generation, agriculture and food production and Bright Hope World has already commenced a micro-enterprise loan programme with Thomas in Juba (SUD01). We like the concept of agriculture development in this part of the world, it is a very needy area and there is little investment in development. We also like Thomas' enthusiasm and vision for this piece of land. However, there are a number of significant risks in this country which make it a very fragile partnership. The vision is to develop the farm as a functioning, economic unit. The plan is to grow seasonal crops in the two rainy seasons and over a number of seasons to develop permanent crops. The purpose is to develop the farm over a number of seasons so it produces profit to be invested in other development activities.